Are you drawn to modern, mid-century, or contemporary interiors, but also like the textures and beauty of rustic or global decor? Or perhaps, do you have a more traditional aesthetic but like the casualness that "coastal" interiors evoke? Or are you transitional, but can appreciate the unique vintage find? These are all common scenarios when you have eclectic taste, just like me! I am drawn to elements of several design styles. I think the key to seamlessly blending styles is by following what we designers call the "elements and principles of design", but knowing when and how to "break or bend" such "rules". At first glance, it's hard to give a specific aesthetic to this design - other than eclectic! 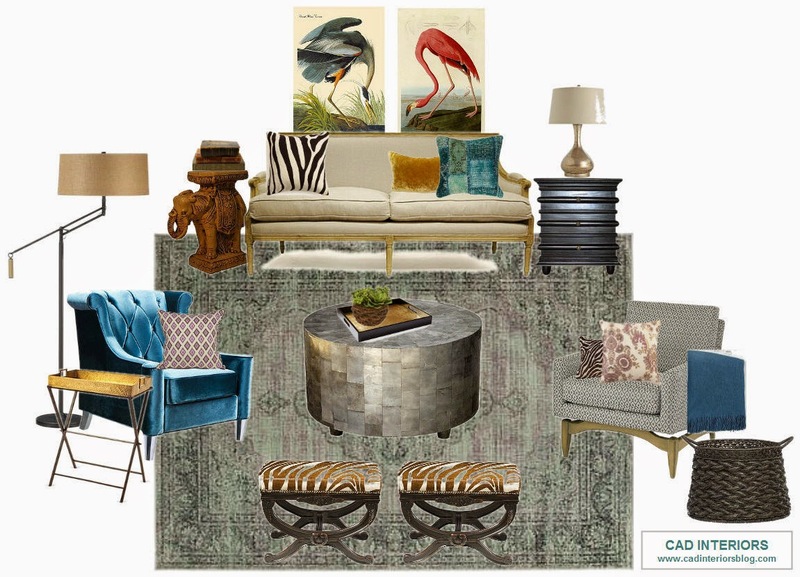 This room design all started with the leopard ottomans serving as inspiration. A little traditional, modern, mid-century, and transitional was thrown in there for good measure. The crane and flamingo wall art, coupled with the elephant stand, added the touch of quirkiness and unexpected element that I love to incorporate into all my designs! Scale, balance, and repetition of colors, patterns, and textures were key design principles that helped achieve a cohesive design - despite everything in the space being "mismatched". If you need help with a room design, or perhaps just need a little design direction, CAD INTERIORS would love to partner with you to make your house YOUR HOME! Contact me today for a virtual consultation and/or e-design services.